So far our previous labs have been dedicated to configuring and troubleshooting routing and switching. This lab is a little different but is still an essential part of the network engineer’s knowledge base. In this lab we will use tools like ping, and tracert along with show commands like show ip arp, show mac-address-table and show cdp neighbors to explore and document an existing network using nothing but a telnet session on a host PC. Learn how to find the physical connection of a device using an IP address as the starting point. Learn to use telnet to connect from device to device. Learn to find the IP address of a host device. Learn to get the physical address using the IP address. Learn to use and understand ARP. Learn to use and understand mac-address-tables. Learn to use and understand CDP. Learn to use and interpret the show interface command. You are a network consultant and your services have been contracted to document an existing network. You have been provided a PC connected to the network along with the console password of “sanfran” and the enable password of “cisco” which should provide you with full access to all routers and switches. No one knows much about the network configuration but they do have a list of host computers and servers. There is a DNS server in place and is believed to be running and up to date. The network is spread over three different sites and it is not practical to travel to these sites so you will need you knowledge to explore the network remotely via telnet. A hostname is a label that is assigned to a device connected to a computer network and that is used to identify the device in various forms of electronic communication such as the World Wide Web, or a Local Area Network (LAN). Hostnames may be simple names consisting of a single word or phrase, or they may have appended a domain name, which is a name in a Domain Name System (DNS), separated from the host specific label by a period (dot). In the latter form, the hostname is also called a domain name. If the domain name is completely specified including a top-level domain of the Internet, then the hostname is said to be a fully qualified domain name (FQDN). An Internet Protocol address (IP address) is a numerical label assigned to each device (e.g., computer, printer, or Server) participating in a computer network that uses the Internet Protocol for communication. An IP address serves two principal functions: host or network interface identification and location addressing. Its role has been characterized as follows: “A name indicates what we seek. An address indicates where it is. A route indicates how to get there. MAC addresses are most often assigned by the manufacturer of a network interface card (NIC) and are stored in its hardware, the card’s read-only memory, or some other firmware mechanism. If assigned by the manufacturer, a MAC address usually encodes the manufacturer’s registered identification number and may be referred to as the burned-in address. It may also be known as an Ethernet hardware address (EHA), hardware address or physical address. A network device may have multiple NICs and will then have one unique MAC address per NIC. Address Resolution Protocol (ARP) is a telecommunications protocol used for resolution of network layer addresses into link layer addresses, a critical function in multiple-access networks. Tracert or traceroute is a computer network diagnostic tool for displaying the route (path) and measuring transit delays of packets across an Internet Protocol (IP) network. To display the Address Resolution Protocol (ARP) cache, where Serial Line Internet Protocol (SLIP) addresses appear as permanent ARP table entries, use the show ip arp EXEC command. Use the show mac-address-table user EXEC command to display the MAC address table. This command displays the MAC address table for the switch. Specific views can be defined by using the optional keywords and values. If more than one optional keyword is used, all of the conditions must be true in order for that entry to appear. Can you please email me or send me a download link to your first CCNA labs? I am not ready for the ultimate CCNA. When I click on CCNA labs, the first line says “So far our previous labs have been dedicated to configuring and troubleshooting routing and switching”, and, I don’t see what link i would click on to download the actual beginner CCNA labs. 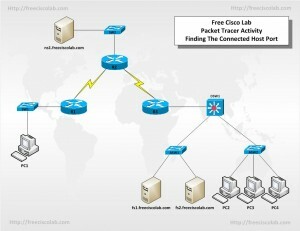 I would suggest you check out my other site http://freeccnalab.com the labs there are all CCNA and use Packet Tracer. thank you very well !! !